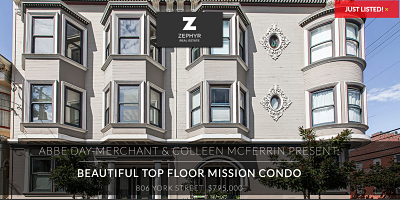 This Top Floor, two bedrooms, one bath Condo in the Inner Mission is an impeccably renovated and cared for Edwardian with lovely San Francisco period details! The building is detached on three sides allowing for lots of southern light and lovely outlooks over hills and the city. The updated eat-in kitchen has quality cabinets, gas stove and stainless steel appliances. The floors are beautiful hardwood throughout, new carpet up the stairs and the large bathroom has plenty of storage space. It’s freshly painted and ready for you to move in! There is also a HUGE private storage area in the basement that comes with the unit. This home is perfect for all the needs of modern day living! And it has….VIEWS! Views of both the hills and downtown add to the beauty and quality of life. The Inner Mission is an amazing neighborhood filled with history, great weather, and foods of all styles, music and more, all just steps away. 806 York Street is close to HWYs 101 and 280, BART and all that the Mission has to offer in the best of Cities! Highlights: Great light 2 bedrooms 1 bath Closets with built-in systems in both bedrooms Upgraded kitchen and bath Eat-in kitchen Skylights Stainless steel appliances Washer/Dryer in the unit Quality finishes throughout Preserved period details Fireplace insert & mantle High ceilings Full private storage area in basement Views Easy commute to downtown, Peninsula and SFO airport HOA dues of $250.00 monthly Location, Location, Location. (2) weekends of open houses, LOTS of showings and 15 excellent offers for this farmhouse charmer! Thanks to all the Agents who worked so hard! Great Ingleside home that is move-in ready, and, has even more upside! Cute, lovely floors, freshly painted in and out with a huge back yard! Only 1/2 block from transit, shopping and more! Please share this with the people you care about, because it is uniquely San Francisco! Classic Doelger – Pano Views! Diamond in the Rough – Really! Mission Hottie SOLD – Outta the Park! You Missed this Hot two-plus bedrooms, two story condo with… Gourmet Kitchen, Deeded Deck, Skylight Bright, – PARKING – Walk Score of 97 and so much more – really! Sold in Multiple Offers before it was the new Real Estate Trend! You owe it to yourself ($$) to contact us if you are thinking of selling your home or condo! Call Today! Charming Sunnyside! Centrally located! Come see this immaculate 1928 home with Craftsman styling and a wonderful flow. Gleaming hardwood floors grace this home throughout the Foyer, Formal Dining room and Formal Living room with wood-burning fireplace, period detailing and lovely southern light with views of the mountains, trees and city lights. Two bedrooms with views of the mountains and city lights, one bath. The updated kitchen is warm and inviting with the original O’Keefe and Merritt gas range, stone counter tops and new dishwasher. The back yard is home to a lovely deck perfect for entertaining and the spa/hot tub. In the garage you will find lots of room to store all your stuff, the laundry area completed with newer HE washer and dryer and space for one car parking. Close to Safeway; Sunnyside Playground; Glen Park shopping, restaurants and BART; easy access to HWY 101 280 close to newly renovated Balboa Park with pool and BART; Close to City College and Ocean Avenue improvements aka Whole Foods opening August 29th!